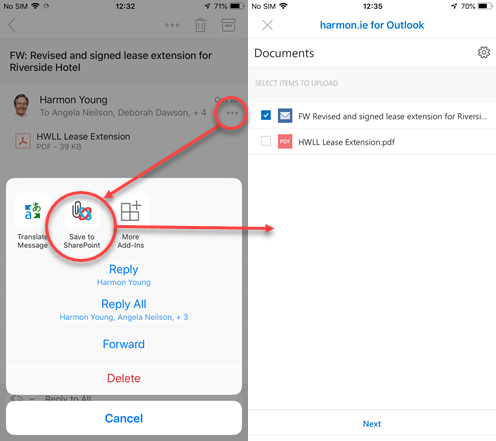 With today’s new major update to our Office App for iOS and Android, harmon.ie is completing the email management story by being in the Microsoft Outlook Mobile app.. Extending the power of intelligent email management to every device allows users to save and classify emails and attachments no matter where they are. In this blog we’ll discuss the benefits of harmon.ie being available for mobile and how this will change email management for the better. Email is the primary method that knowledge workers use to communicate important information – but businesses routinely disregard emails as essential sources of information. Although important information is shared in emails, too often businesses don’t have effective email management practices. Ineffective email management can lead to conflicting versions of the same information, and a lack of visibility of important business information. Email conversations or threads may be buried in individual inboxes or deleted, creating potential breakdowns in communication. To intelligently manage emails, businesses must treat them as the important documents they are. This requires capturing and classifying them in a way that enables workers to easily access them from a centralized location like SharePoint. 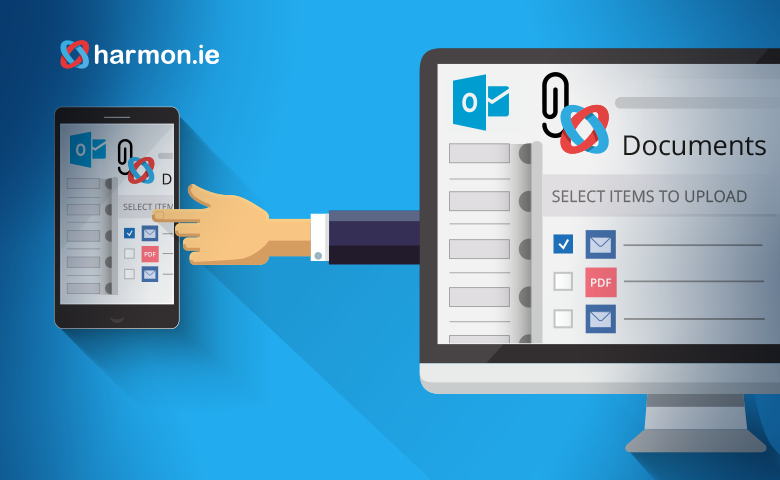 harmon.ie helps businesses achieve this by allowing workers to drag and drop important emails from Outlook directly into SharePoint and providing a simple prompt for entering crucial metadata to classify them for easy access. Until now, workers who access business email from mobile devices, such as salespeople out on the road, have been unable to classify emails until they’re back at their desks. This creates a gap in email management practices, leaving workers incapable of documenting their emails until they’re on a desktop with access to harmon.ie for Outlook mobile app. To combat poor email management, we've released the harmon.ie Office app, which is now accessible via Outlook on mobile devices. Now, mobile workers are able to save emails directly as documents of record in SharePoint. Globally, mobile phone usage is at an all-time high. In the US, people check their smartphones an average of 52 times a day. In 2016, Frost and Sullivan found that workers who use smartphones as part of their workday gain nearly an hour (58 minutes) of work time every day. With the advances in technology in just the last three years, workers have more intelligent and capable devices than ever, leading to improved productivity. Now that many businesses are operating in the cloud, workers are able to access business apps from their phones: behavior like checking emails first thing in the morning and last thing at night, while commuting and while on site have become normal and even expected. Modern work styles are characterized by a constant flow of information and demands for increased productivity, and smartphones can help workers manage their emails between working days. The ability to access the important information in email inboxes allows workers to stay updated and share their knowledge more frequently. This has a clear positive effect on productivity. However, without intelligent email practices, it is impossible to work in a manner consistent with business email policies and standards. While workers may have been able to read or reply to emails, this has been the extent of their interactions – without the ability to transform emails into documents of record, they haven’t had the tools necessary to manage the information contained within. To combat this, we’re introducing harmon.ie app for mobile, which makes intelligent email management easier and more effective than ever with the ability to save emails as documents directly in SharePoint. The Radicati Group estimate that 128.8 billion business emails are sent every day – this is a 5% increase on last year’s estimate. To cope with the sheer volume of emails being sent, businesses need to take advantage of better email management practices. Without email policies, it’s impossible to store important business information in a transparent and compliant way. Companies who don’t adapt to more intelligent email management methods will risk falling behind competitors who are reaping the benefits. harmon.ie helps workers increase their productivity, while streamlining their email management processes. Workers can save emails as documents directly to SharePoint, and work from a single source of truth. Version control is simplified, records are complete and compliant, and workers are able to find what they need when they need it. Arming workers with the best tools available is the only way to establish intelligent email management practices which will future-proof your organization. harmon.ie is the solution that will help you succeed. To find out more about how harmon.ie can help your business improve your email management policies and increase your productivity, contact us today.